Hello and welcome to the One A Day competition for MARCH. Regular runners will have a good idea of how this works already but for maiden runners and for those with plenty of experience please read on as there are a couple of subtle changes this month. Anyone who doesn't put in the effort and writes something like "I fancy X to win because he is white and they are faster", "I like his name", "my friend told me so" etc. etc. won't be considered nor will any copy + pasting from other sites. YOU MUST INCLUDE AT LEAST 4 SEPARATE POINTS ON WHY YOU FANCY THE HORSE. You need to make this reasoning at least 30 words but feel free to be as detailed as you like. - Do not edit your post once made. - If your selection is a non-runner you can select again but please do this in a separate post. - You can post a backup selection in case your first selection is a non-runner and you don't believe you'll be able to update your selection in the case of a non-runner. However, if your first selection runs then that is the one that will be scored. - Failing to post a selection will see you not scored for that race. You can PM myself or another member to post on your behalf but again, the selection must be posted before the race starts. - On the last race day if the competition is tight those in contention can PM me their selections and I'll hold them until the race starts. If I'm involved then I'll ask for a neutral to step forward and hold the selections until the off. This is so copying a fellow runners selection to assure the win/place is avoided. 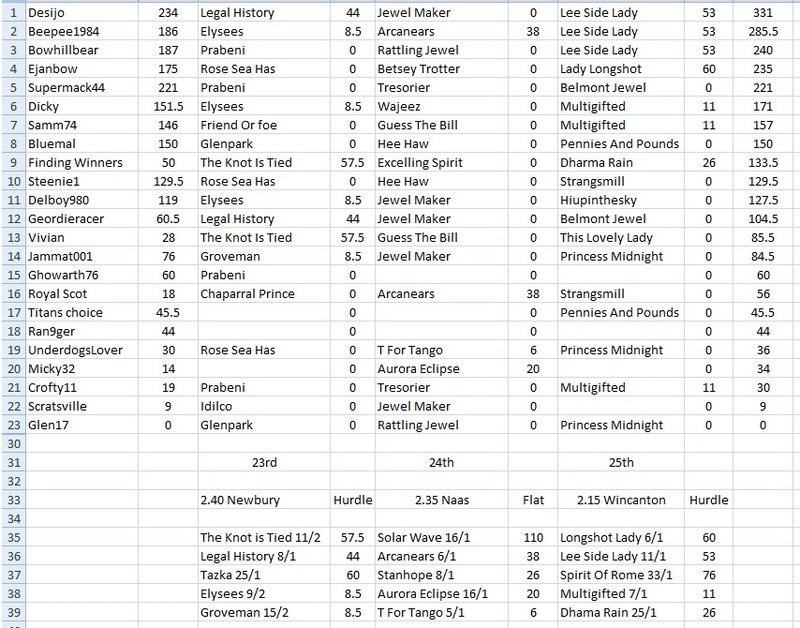 - If a day's nominated race is on a card that is abandoned we will have two races the following day. If this occured on the last day of the race we'll run an extra race the following day whilst also starting a new competition. After discussions with regular runners in our races via PM it's clear that the thread a day isn't too popular and that you would all like some input in picking races so we'll revert back to one thread for picks and you can all have input in picking races. 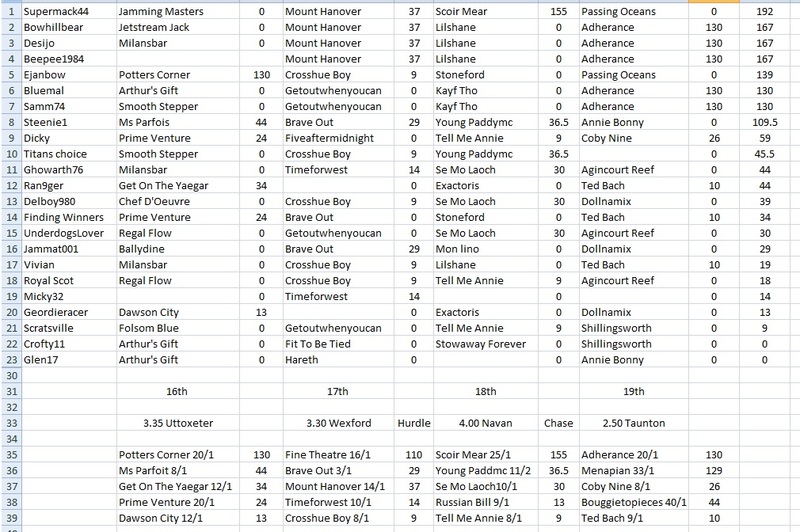 I've started the new thread (we'll do a thread for race 1 then a new thread for race 2 so it's easier for me to trace back for selections as I score up the races). I will usually pick the first race and the Saturday races but feel free to offer a race up if I seem to be taking my time. I reserve the right to void a race if circumstances significantly change the dynamics of the race - ie, mulitple late withdrawn horses significantly reducing the field (below 6 runners). Hope that makes sense, any questions ask here or PM me. Please note, when selecting races, please refrain from MAIDENS/NOVICE events including BEGINNER CHASES as these can be difficult in placing a reasoning to. Handicaps and higher class races (listed, graded or group) are preferred but please try to find a race with a competitive sized field. To encourage people to look away from favourites as well there will be bonus points for the price of the horse as shown above. This means that if someone picks a 2/1 horse that wins they will get 40pts (30 for winning and then 5 times 2/1 is 10 -> 30+10=40) while if someone picks a 10/1 shot that comes second they will get 50pts (20+30=50). 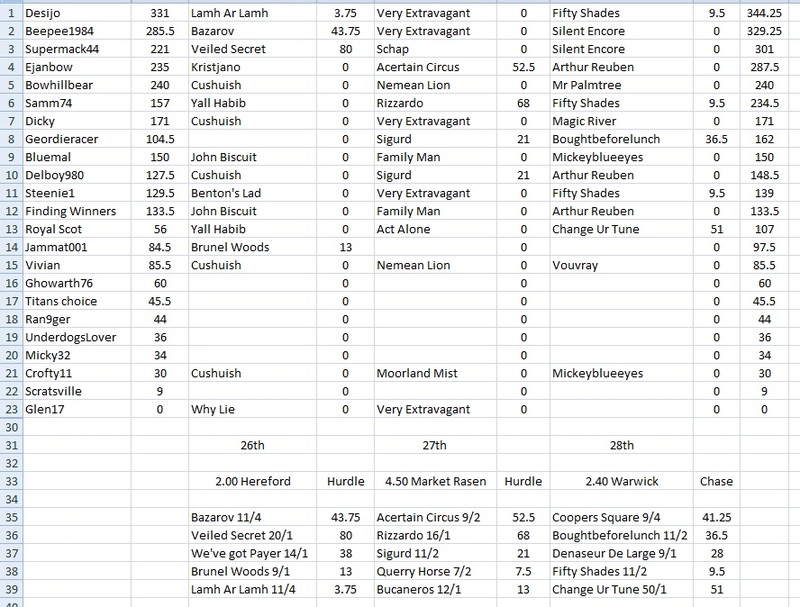 Please note, scores will be rounded up to one decimal place from January's second race! Dead heats - the points of the places are added together and divided by the number that dead heated. i.e. if 1st place is a dead heat then both 1st placed will get 25 pts (30+20pts) and x4 SP (5+3/2 = 4). I will update this thread with race results and they'll be contained in the post directly after this one and an updated leaderboard. I hope to do this every three days and daily towards the end of the race but please be patient as occasionally life will get in the way of me doing this promptly. 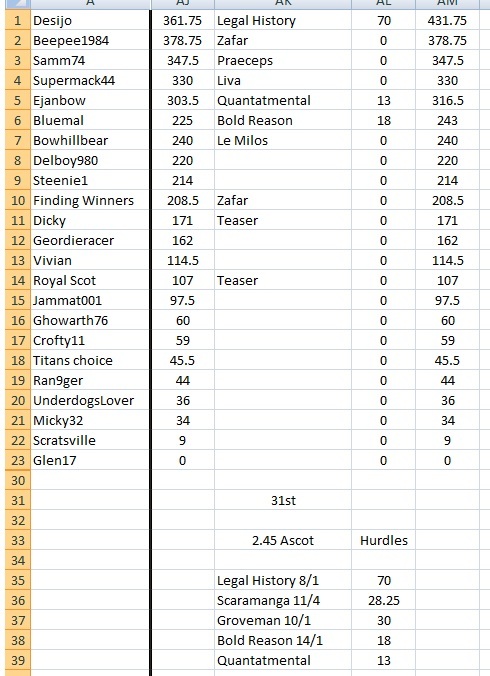 In the event of any ties for prizes, the tied runners will be split by their highest scoring selection for the month, regardless of actual finishing position (ie, a 1st place scoring 100pts does not outrank a 2nd place scoring 120pts). Please also check your scores. Mistakes do happen, I am only human I keep the scores on a Excel spreadsheet (which I can access from my home and work so it's easy for me to keep it updated). Any scoring queries please PM myself rather than posting in either this thread or one of the daily selection threads. Not much change at the top except for Desijo overtaking Supermack44 by getting more points yesterday but it is still a tight race. Dicky has jumped from 9th to 6th by selecting today's 80 points, well done. Only Delboy980 scored on all three days. Still plenty of races to go. What a quiet weekend with not much scoring done especially yesterday with only 3 gaining any points. Desijo still holds the lead but Beepee1984 gaining on him after being the only one to score on all three days. Desijo in the 300's but a clutch of players in the 200's so still anybody's race. A very quiet few days with few scoring, four on Tuesday, four yesterday and five today. 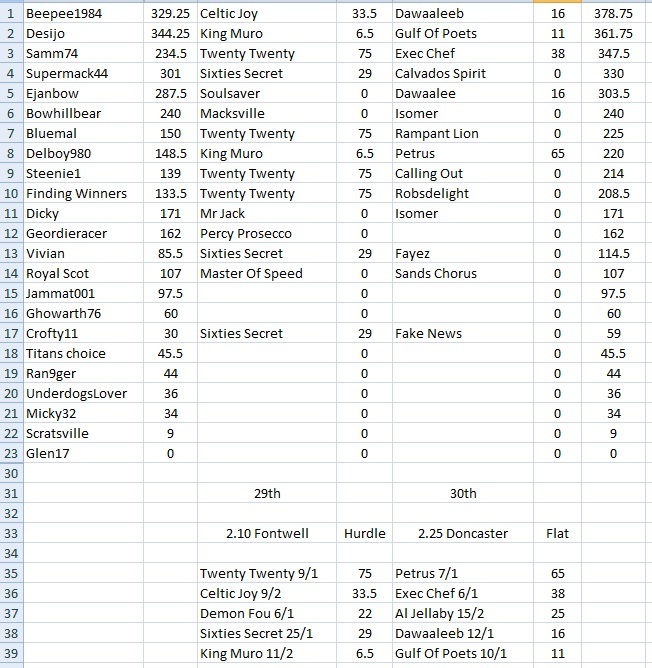 supermack44 picked a 20/1 2nd on Tuesday and Samm74 had a 16/1 2nd yesterday and Royal Scot a 50/1 today but Desijo still holds a slim lead with three others closely in his slipstream. Underdogslover pulling up as his dog is near his last days and wants to spend time with it. Thank you to all that p.m.'d me and remarked on my sister's success in The Chase, my late Mum would have been like a dog with two tails to see Anwen on one of her favourite programmes. Still very close at the top but Beepee1984 has taken the lead off Desijo, tho one to make the biggest move is Samm74 who has gone from 6th to 3rd after scoring decent points yesterday and today. One day to go and it is still any of the top 5's race. New race already up on the forum. Last edited by ejanbow on Sun Mar 31, 2019 4:07 pm, edited 8 times in total. Location: Somewhere nice and warm. This horse finished placed in this last year and went on to finish 5th in the Grand National. Loves heavy ground and extreme distances so this 4 miles 2 furlongs trip will suit. Has Bryony Frost aboard who can round off a great week with a win here. Everything in place for a big run here. CD winner just a place in his last 6 runs. Carrying 10-6, claimer taken off -3. Was 3rd of 8 at Taun recently on gd st..
will like the trip & going.. Picking Smooth Stepper in this race as it has ran 3 times at this course and it has placed in 2 of them but they were in class 2 and class 3 races and this is a class 1 handicap chase.It has ran 19 times in chases and it has won 4 and placed in 4 of them.The going for this race is soft/heavy in places and this horse has won 3 times on soft and placed 2 times on it and it has also won and placed on heavy so it should be ok with the going. Not be at his best so far this season. Runner up in this last season in heavy ground before an 5th place finish in the National. Jockey Frost comes into this off the back of a good Cheltenham. Distance and conditions today should be fine. A Sam England trained 8 year old who has had 12 races over the chases winning twice and has finished in the frame 4 times. His last win came in Dec in a class 2 handicap chase at Haydock over 3m 3 1/2f on soft going ridden by today's jockey Johnathan England where he beat the fav Back To The Thatch by 2 3/4 lengths. He finished 3rd of 15 runners last time out back at Haydock in a Grade 3 Grand National trial over 3m 4 1/2f on good going only beaten 2 lengths. He in a Listed class 1 handicap chase over 4m 2f on soft going. This gelding finished 4th last time he run on this course to Crosspark , he has since won on soft going, this is his first try over this distance, will appreciate the going if getting the distance has a e/w shout in this race today. Unrealistic to expect a win, but could make top 5 at enormous odds - given that he is bottom weight with an in form 7lb’s Claimer on board who has ridden him before. 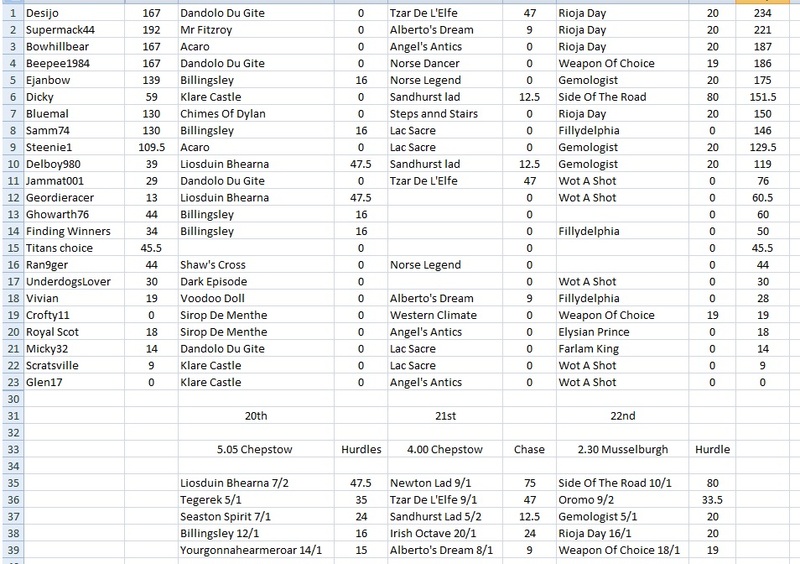 Has won 5 races overall at up to 3 miles and distance and conditions may catch out some in this field. Second runfor a new Trainer too.